Home is where the heart is, and CAW’s heart has been in El Barrio ever since we began offering arts programs there 30 years ago. We are excited to be offering a new art workshop for families with young children at Artspace PS109 every Saturday in February. The program is based on our successful Art Around the World curriculum, in which children first learn about art history and then create their own versions of art works inspired by world cultures. During the first session, participants created self-portraits inspired by the works of Mexican artist Fredia Kahlo. In the second session, they made watercolor paintings of their family inspired by the works of Chicana artist Carmen Lomas Garza. Making art as a family. Back row: Magdalena and Ariel; front row: Nandi, Percy and Idalis. Clayton works on a self portrait. Teaching Artist, Beata Drozd, who also teaches a CAW Portfolio Prep Class at the nearby Renaissance School for the Arts, finds the Saturday morning classes stimulating. "The kids are very energetic on Saturdays, and I love it, because that’s when creativity shows in their artwork." Making art can also have therapeutic value. When a discussion about family connections unexpectedly upset some children who were having difficulties at home, Beata and her Teaching Artist Assistants were able to successfully redirect the discussion by encouraging the children to create art about their family. Thanks to CAW’s relationship with the NAEA Student Chapter at Teachers College, we have volunteer teachers assisting Beata at Artspace PS109, such as Vanessa Arnold and Ava Cotlowitz. We look forward to the enthusiastic participation of more Teachers College volunteers during upcoming sessions. 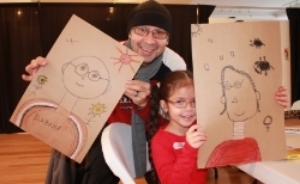 6-years-old Idalis bonded with her father over their passion for drawing.